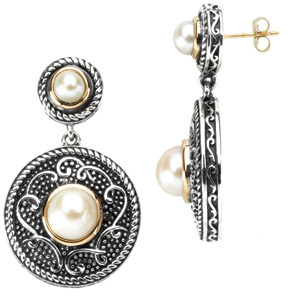 Sterling silver genuine freshwater cultured pearl dangle earrings have a braided and beaded finish. Earring dimensions: 35mm x 21mmm. These pearls measures 5mm and 8mm. This item is sterling silver with 14kt yellow gold accents. Weight: 14.54 grams.